yo and pull through all 3 loops. Working from left to right, work sc backwards. Pattern Row 1 - ch3, dc2tog in each sc to last sc, 1dc in last sc. Turn. 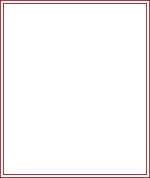 Pattern Row 2 - ch1, 1sc in base of ch1, 1sc in each dc2tog to end, 1sc in top of ch3. Repeat Pattern Rows 1 & 2 until twenty six rows have been worked in all or placemat measures 10 Inches from beginning. Turn. Starting with ch1, work 2 more rows of 1sc in each sc around all sides, working 3sc in corners. Turn. Work 1 row of crab stitch (see abbrev) all around four sides of placemat, working 2 stitches in each corner, sl st to first sc on beginning of row. Fasten off. 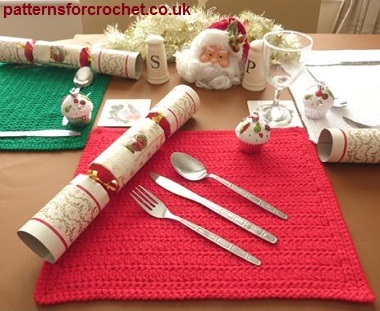 Hope you enjoy this free crochet pattern for festive placemats.